Hobbits have been living and farming in the four farthings of the Shire for many hundreds of years. Quite content to ignore and be ignored by the world of the Big Folk. Middle earth being, after all, filled with strange creatures beyond count.Hobbits might seem of little importance. Not renowned as great warriors nor amoung the very wise. In fact it has been remarked by some that Hobbits only real passion is for food. A rather unfair observation as we have also developed a keen interest in the brewing of ales and the smoking of pipe weed. But where our hearts truly lie is in peace, and quiet, and good tilled earth. For all Hobbits share a love for things that grow. And yes, no doubt to others our ways seem quaint. But today of all days, it is brought home to me: It is no bad thing to celebrate a simple life. Bilbo Baggins on Concerning Hobbits. Keep it simple. Right? Pretty good advice from an old Hobbit who has quite a tale to tell! 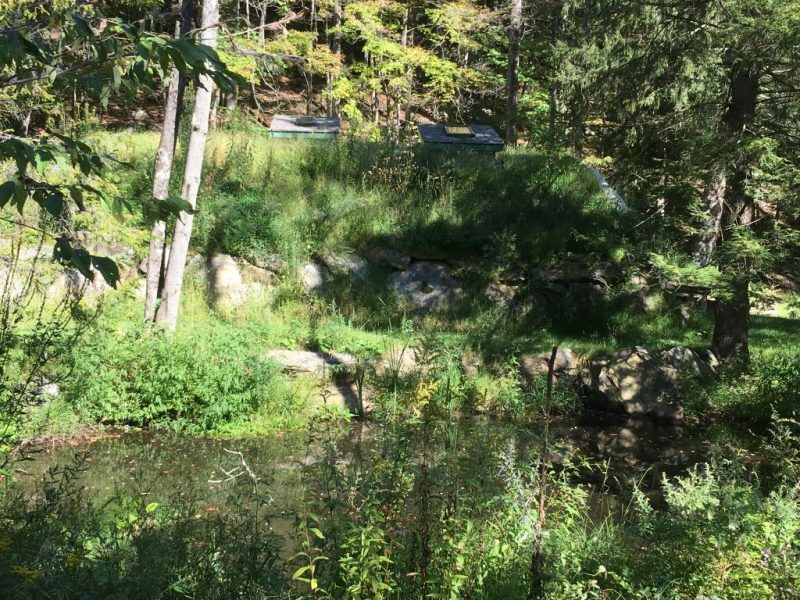 And I welcome you once again to the Hobbit Hollow Construction Blog! TA DA! Enough with the hats and horns Jim. You ain’t there yet. Not by a long shot. Alright already I’m just trying to get my motivation going that’s all. Is there a problem with that? You ever see someone do something and as you’re watching you’re thinking to yourself, “Who the heck showed this guy how to do that???!! !” Had one of those moments the other night. The Editor and I went early over to Mckinney and Doyle for dinner on Saturday. Nice place right in town about 5 minutes from the Hobbit house. It’s hard to get reservations there cause it’s so popular, but if you get there early and there’s room at the bar you can sit down and have dinner right there at the bar without making a reservation. Not bad if you don’t mind an early dinner. So it was great as usual. I had the brook trout and the Editor had the ultimate burger. So we’re at the end of the bar looking down the length of the bar. So you can see everybody who’s there. Okay Jim let’s get to the point soon you’re losing us. Okay! So this guy two seats down from us gets this little loaf of bread. (Everybody gets a little loaf at the start from their bakery…so good.) Then he starts to cut slices of it. I don’t think I’ve ever seen someone mangle a piece of bread like this guy did. I mean this was a massacre. Like of epic proportions. And you get a special bread knife to cut the bread with as well!! I found myself starring at this guy cutting his bread. Luckily I caught myself and would just glance every one in a while to make sure that I wasn’t imagining what I saw. It was as if this guy was cutting a loaf of bread for the first time in his life. Hadn’t a clue. The pieces that he was cutting weren’t even big enough for a pigeon to eat if you can wrap your head around that one. Oh yeah and forget about buttering your bread. Not a hope. I guess you had to see it. It was like watching a train wreck in slow motion I tell ya. Maybe I didn’t explain it so well. Well let me tell you about my adventures over at the Hobbit house this weekend. At least I have a few pictures to throw in there to help with my lack of explanation expertise. So the main focus of this weekend was going to be figuring out the radius of the exterior trim around the windows. Remember I’ve got this Ohio connection. Remember? Yeah so the guy tells me all I have to do is send a template of the radius made out of rosin paper and we’re good to go. It’s a Hobbit house people. Nothing is easy. On top of that we’re trying to get some Passive House aspects incorporated into the house as well which makes it a double whammy. 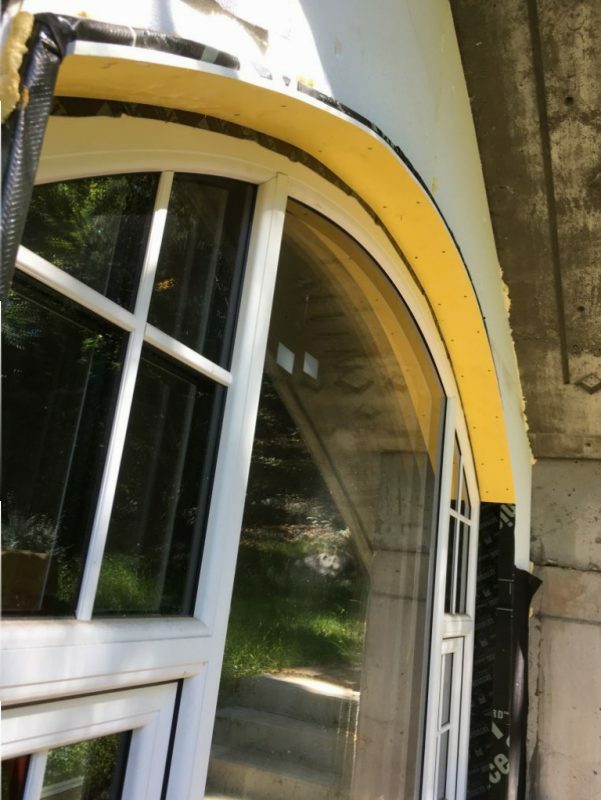 Needless to say the exterior trim is not the outside radius of the window. There’s a build up there….some of which I haven’t even installed yet. 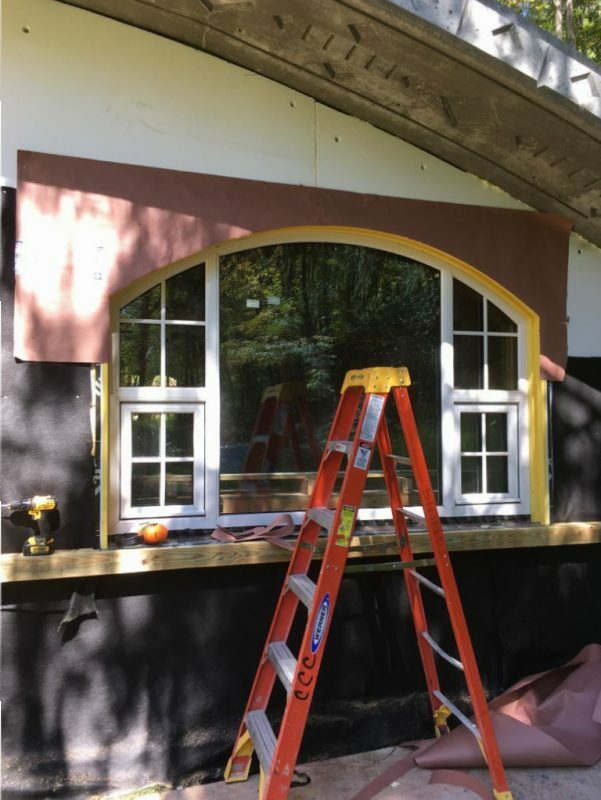 Said build up is the exterior trim deal for the window. It’s quite involved. Let me show you what I did. 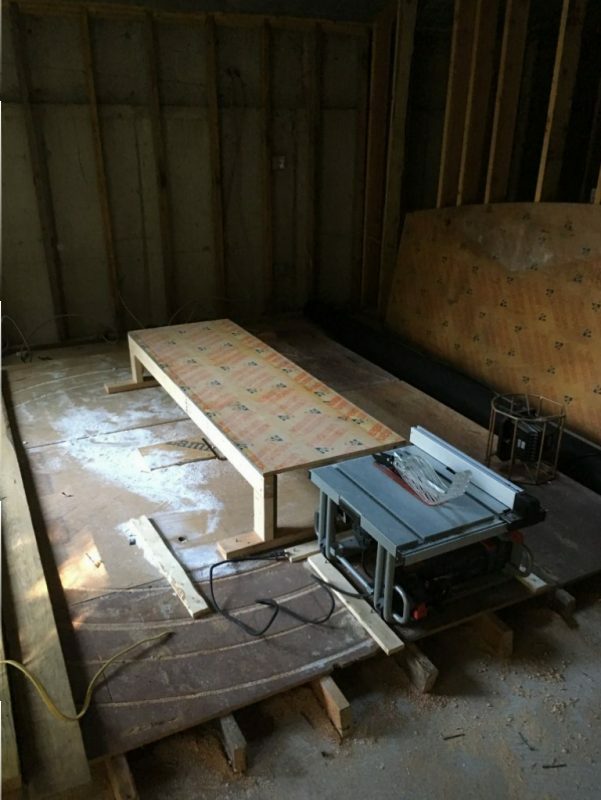 The first step believe it or not was to build a table saw bench so that we could rip down the 4×8 sheet of Azek trim we need. I should have made it a little wider but I wanted to minimize the width as much as possible. Check it out. 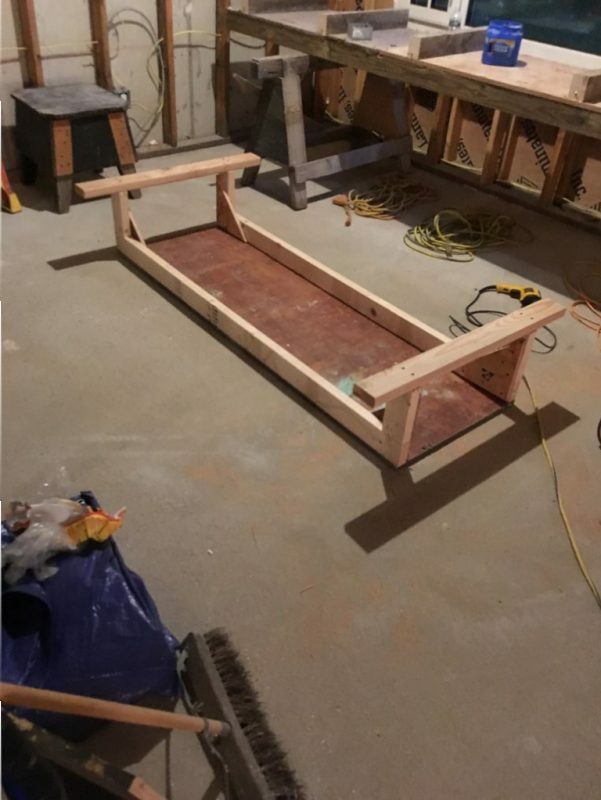 I made the base long so I could nail it into my platform so it wouldn’t shift as I push the wood through the saw. Here it is set up. Table saw with support bench..
I’ve never owned a table saw but I like this one so far. It’s a Bosch. Very light and easy to set up. It also has some good safety features to prevent kickback. Nice. So trim of any style is not my forte. I’m more of a woodbutcher if you will. So trim is a little more time consuming for me than maybe for a guy who’s really into trim work. Plus that’s not what I do every day of the week to begin with. Doing curved trimwork is a little out of the ordinary as well so maybe it’s not just me. In a nut shell: The idea was to trim out the extensions with ripped pieces of 3/8 Azek and then trim the opening inside and out with 1×2 Azek. A series of pictures. finish the 1×2’s on the arch. I purposely left out the sill because of time restraints. 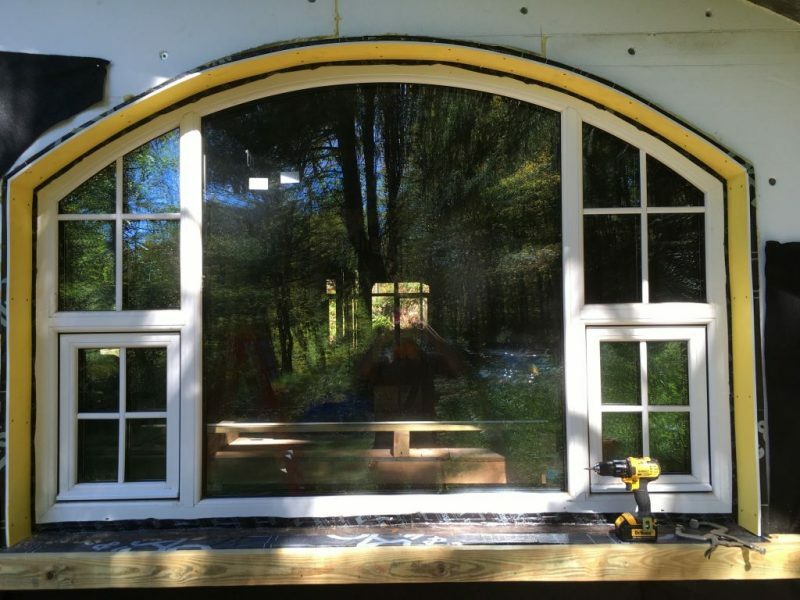 Remember it’s a three week lead time to get the arch trim manufactured. I screwed the 1×2’s in so I could take them out and put the sill in later. So now I’m ready to do my template out of rosin paper. I did it but I’m going to redo it next weekend. Definitely a learning curve on this one. First I put the paper up using 8penny nails to hold it tight. Next I cut back the bulk of the paper that I didn’t need. Which you can see in the above picture. Just being honest here. It’s not a perfect arch. 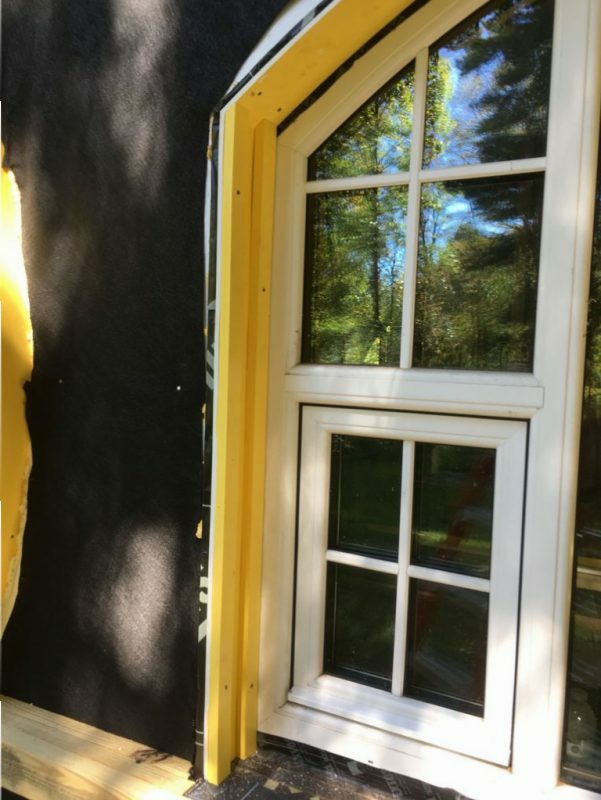 The original window is but the trim definitely is not. What to do? I used a 3/8 inch spacer block and cut the paper back 3/8 of an inch back from where the edge of the trim touches the paper. 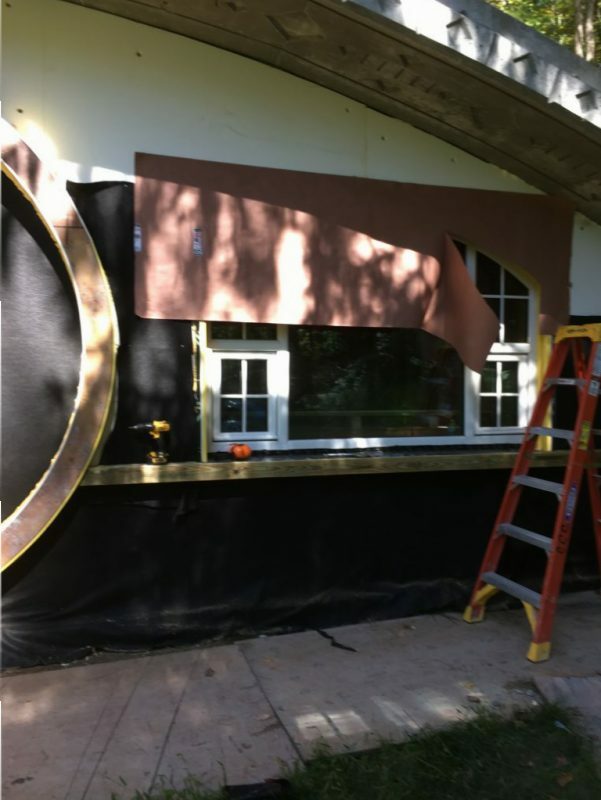 This way the trim that I’m going to have made in Ohio will cover up the trim that I’ve just installed leaving a 3/8 reveal when you look from the inside of the house out. Hmmm. I lost you didn’t I. Sorry. Needless to say my rosin paper template is not perfect. So we will tell the manufacturer to use the smallest radius they come up with for the template. This will cover any imperfections. Like I said: Keep it secret. Keep it safe. Rosin paper template cut out. Stay safe and I will see you next week. The green trim blends in nice. So simple. A simple life. Why is the Water Foaming?…..Gotta Get Organized Here. Thanks for the vote of confidence John. Much appreciated. By the way my son Ethan’s friend Sandra from Sweden showed us the first Hobbit house in Stockholm. Look up Hobbit Stockholm and it will come up. This guy has the round door. There are some good construction pictures in there as well. Check it out. I love you DADDY !!!!!!!!!!! Sonny! I’m interested in how this all came about! Hope everything is going well. Did I get a passing grade? Or do I get to do it over and get a little extra credit? Hi John! I did read your comment on the message board. Safety is a big part of everything now on a lot of levels in the high rise world anyway. It really is too bad about those construction workers. Things happen very fast when they go bad. And unfortunately a lot of guys don’t have a lot of experience either and or take what they are doing to lightly. For any number of reasons. I have seen the house you mentioned before. They did a heck of a job. The butterfly window must have cost a small fortune. It definitely has the right look. The door and hinge are a work of art though. Good point about the seal. It’s a great question. My family wanted the round door on the house I’m building as well. 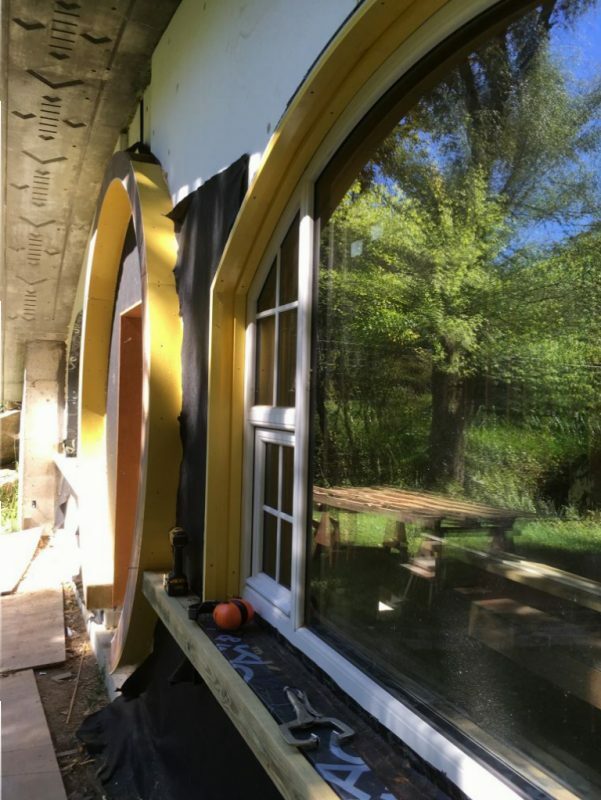 But to get the airtightness I wanted I didn’t think it would be worth the cost. It is a serious design hurdle. 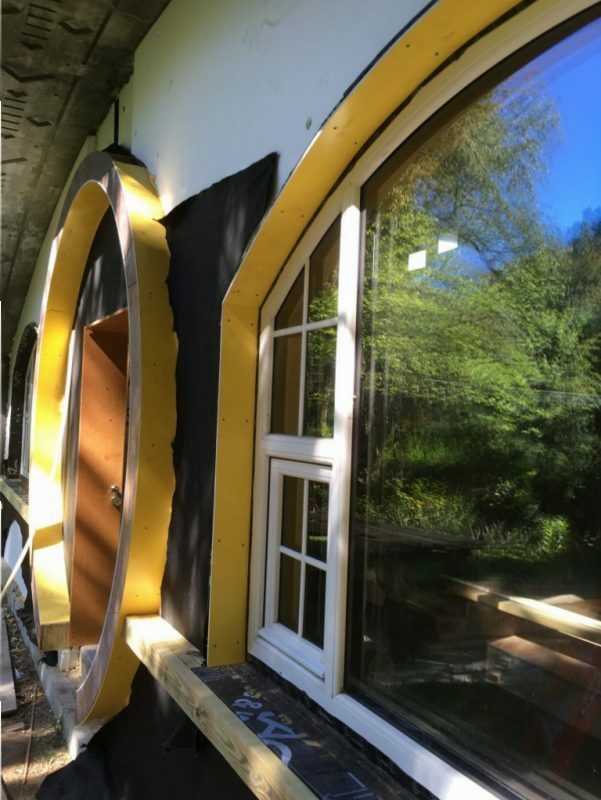 Round door with a single hinge made to Passive House standards. Definitely way over my head. Let’s see how what I have in mind turns out. Thanks for writing as always.